Midnight, Texas is a small town and the residents have their secrets. Manfred’s new in town but is warmly welcomed, although he’s unsure about the man holding his hand under the diner table. He soon learns that one member of the community is missing, but no foul play is suspected. Well, not until the day the whole town goes on a picnic and finds something that definitely ruins the mood. I love Charlaine’s idea for a new series. The town of Midnight is populated with minor characters from her other series. There’s been hints in the past that her books all exist in the same universe, with Lily Bard popping up in the Sookie Stackhouse mysteries. Although this universe contains vampires and witches, I like the idea that some people just don’t come into contact with them or bother thinking about them much. Before going in, I was a bit anxious about spoilers for her other books. I have read Harper Connelly, Sookie and three of the Lily Bard books and want to read the Aurora Teagarden mysteries at some point. Midnight is a town of secrets, where people like to keep their business to themselves as much as they can. From the basis of what I’ve read, the only book spoiler I can think of would be for Shakespeare’s Champion, as Bobo’s past is discussed in a bit more detail. I guess any character that is in this book, obviously hasn’t been killed off or locked up, so you might want to put it aside if you’re new to Charlaine. And then Manfred realizes that all morning, throughout the camaraderie of unloading the van, neither of his companions asked the obvious questions. Why are you moving to such a godforsaken place? What brings you here? What do you do? Where did you live before? And Manfred Bernardo realizes he's moved to the right place. In fact, it's just like he belongs here. I recognised Manfred from the Harper books and was happy to see him as a more fleshed out character. However I did this his sudden and intense infatuation with Creek a little much. It skipped along the line of creepiness for me, even though he otherwise comes across as a nice young man. Arthur, the policeman from the Teagarden books, pops up but with a fairly minor role in this instalment (which gives me a chance to catch up on his native ground). So Midnight has a bit of supernatural about it but overall, the tone felt just like Charlaine’s mysteries. The town has a small community feel with everyone pitching in and being friendly. Once they know you’re a good sort, that is. It’s a bit isolated and empty, but its site at the crossroads means enough people come through to keep life interesting. Oh and Mr Snuggly must be the best witch’s familiar ever. Just you wait… he’s the star of the show. 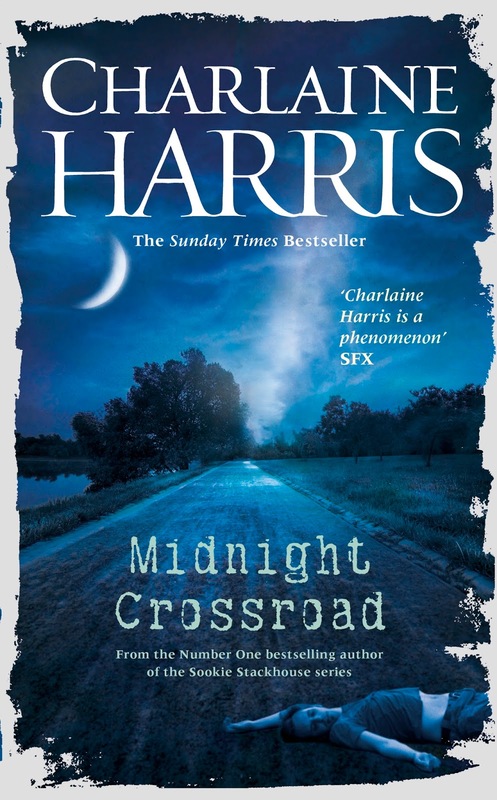 Midnight Crossroad is published by Gollancz and is now available in hardback and ebook editions. Thanks go the the publisher for providing a copy for review. You can also read the first four chapters here. Oh I need to get on and read that anthology. Although I usually only read the bits that are relevant to series I'm reading. I want to red this one so badly! It's next on my list to buy as soon as I get some space in the reading schedule.